Who knew Valentines Day could be so good for you. Chocolates history dates back to the Mayans who believed not only in its divine origins but it’s medicinal properties. Cacao has long been used to reduce fever, anemia, poor appetite, mental fatigue, TB, gout, kidney stones, low virility and to help poor breast milk production digestion, constipation and the nervous system. Today we know how cacao reduces stress, and flavanols improve cognitive function. Cacao has potassium, phosphorus, copper, iron, zinc magnesium, manganese, vitamin C and omega fatty acids that help cardiovascular heart health. In addition cacao help release dopamine and endorphins further reducing PMS symptoms and depression. . . It’s chromium content helps blood sugar levels. 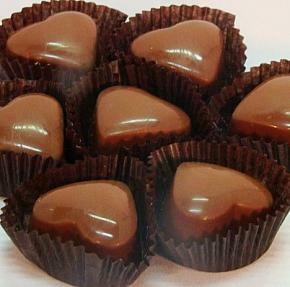 Together chocolates qualities calms and excites your heart in an aphrodisiac way ….. Raw organic chocolate is of course more nutritious than roasted or more processed beans. and choclate should be consumed dark as the minute milk is included, cacao looses its benefits as dairy’s Sodium Casein protein reduces your body’s ability to absorb nutrients. Knowing all this, just imagine the benefits for mom and baby. Actually, science from Ylae University shows that pregnant moms consuming chocoalte 5 times a week, have 40% less risk of preeclampsia, than women eating choclate less than once a week. The University of Helsinki, Finland, found daily prenatal choclate consumption produced infants less fearful and laughing more at 6 months. Perhaps we can assume that all this chocolate also helps make babies with healthier hearts, minds and happier through life.